Whether you believe it or not, climate change is unequivocal and it’s mostly our fault. According to Dr. John Cook and coauthors, who compiled a statistical analysis on the scientific consensus over an anthropogenic cause of climate change, over 97% of scientific papers expressing a position on climate change agree that mankind is to blame for it. Much lower consensus, often less than 50%, is recorded among policymakers and the general public, with Americans less concerned than European citizens. Among the many effects of global warming on the World as we know it, the alteration of climatic patterns might bring an increase in the occurrence of landslides throughout the world. From temperate to tropical regions, where most of the population currently lives, we are experiencing more extreme climatic conditions: more hurricanes and tornadoes, hotter summers and, paradoxically, colder and harsher winters. The increase in the frequency of extreme rainfall events can be directly correlated to an increase in landslides frequency. 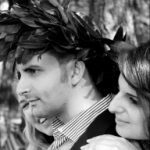 In a recently published study on the journal “Science of the Total Environment”, Stefano Luigi Gariano and his coauthors of the Italian Research Council and the Euro-Mediterranean Center on Climate Change (CMCC), predict an astonishing +45.7% average increase of rainfall-induced landslides, with up to +80.2% average increase in the impact on the population by 2050, in their case-study region – the beautiful Calabria region in Italy – using pessimistic but, sadly, reasonable global climatic models. 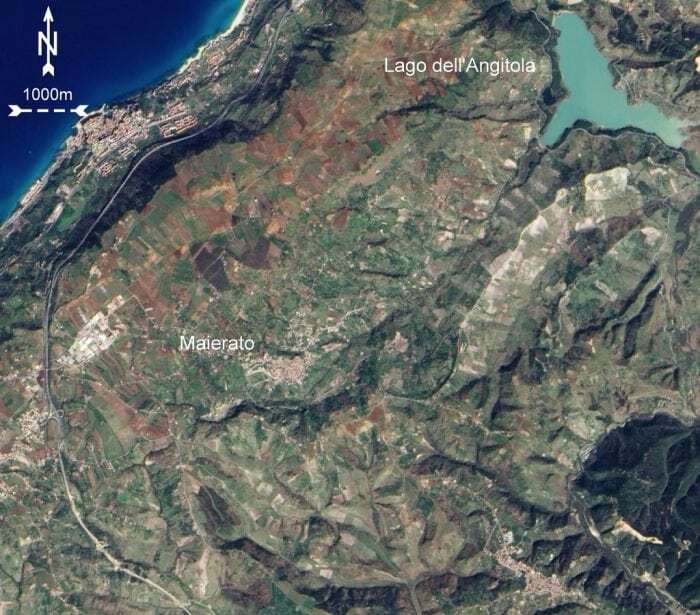 Predicted changes in landslide frequency in the authors’ study area (Calabria region, Italy). Dr. Gariano (Ph.D. in geology with a thesis on the “Impact of climate changes on landslide occurrence, hazard, and risk”) and coauthors calibrated their predictions on a large dataset, spanning over a 30-year period from 1981 to 2010 (only a part of a larger dataset), to correlate past rainfall events (daily precipitation, seasonal and annual total rainfall) and landslide events. Then, they considered different possible scenarios for global and regional demographic and socio-economic changes and trends of greenhouse gas emissions and other pollutants, and applied them to a General Circulation Model. Workflow of the authors’ work: from global climate models to simulations of changes in landslide occurrence, impact and risk. This model (made by CMCC) provided them with a representation of the main atmospheric processes on a planetary scale, which they then regionalized to obtain higher-resolution information on a local scale. In particular, the authors relied on a first scenario in which the global greenhouse gas emissions reach a peak by 2040 and then start to decline. This would be a “mid-way” scenario, in the hope that global policy-makers would succeed in containing the emissions and limit the global temperature rise to 2.5-4 °C in the next 50 years. In a second scenario, called “pessimistic, but business as usual”, they analyzed the effects of a non-intervention, with the emissions keeping rising throughout the 21st century and a temperature rise in the order of 6 °C in the next 50 years. The results of the study are worrisome. They not only predict an increase of the occurrence of rainfall-induced landslides due to more extreme climatic conditions, but also that the increase would affect some areas much more than others. This could be summarized by this mantra: bad weather will get worse, more rain will fall in rainy areas and with higher intensity, more drought will affect arid areas. Much more landslides will occur in some areas, and desertification will spread in other areas. Equally worrying opposites. “The proposed method is quantitative and reproducible”, the authors declared, “thus, it can be applied in similar regions, where adequate landslide and rainfall information is available”. And if the model predicts much more landslides in other parts of the world, it won’t be a surprise anymore. In a recent review paper published on the journal “Earth-Science Reviews”, Gariano and Guzzetti reported that the global models predict that the temperature increase would be “more significant in the northern hemisphere, but also distinct in northern Africa, southern Africa, and central South America. Changes in the surface temperature are expected to influence precipitation, with mean precipitation projected to increase significantly at high latitudes, in mid-latitude wet regions, and in parts of the equatorial regions and of the northern tropical areas of Africa and the Arabic peninsula”. In that paper, they presented the first attempt in the scientific literature of a global map showing general areas of expected variations in the abundance or activity of four landslide types, driven by the projected climate change. Moreover, citing the latest report by the Intergovernmental Panel on Climate Change, they stated that “extreme precipitation events over most of the mid-latitude land masses and over wet tropical regions will very likely become more intense and more frequent” and that there is a “high confidence that changes in heavy precipitation will affect landslides in some regions”. 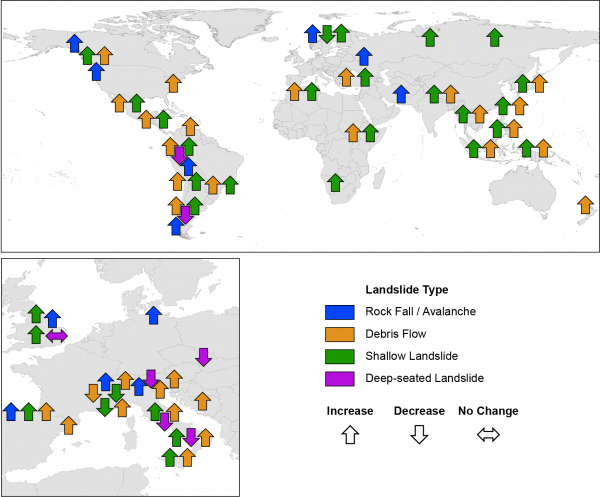 Global map showing the expected effects of climate change on different types of landslide. “Where the frequency and/or the intensity of the rainstorms will increase”, they continue, “shallow landslides, including rock falls, debris flows and debris avalanches, and also ice falls and snow avalanches in high mountain areas, are also expected to increase. These areas include the Alps, the Himalayas and most of the American Cordillera, but also the Atlas Mountains in northwestern Africa, mountains and hills in southwestern Africa, the East Africa’s Rift Valley and the Arabian Peninsula, the Carpathians in Eastern Europe, the Appalachians in eastern North America”. So, what’s next? Gariano stresses that their work is already a practical tool in the hands of policy makers, as it describes in detail which municipalities will be the most affected. “The model we tested”, he says, “deserves to be applied to other regions subjected to high hydrogeological hazard”. More recently, he and the same research group published another paper in which they proposed a first analysis of the influence of past and future changes in land use/cover on landslides. 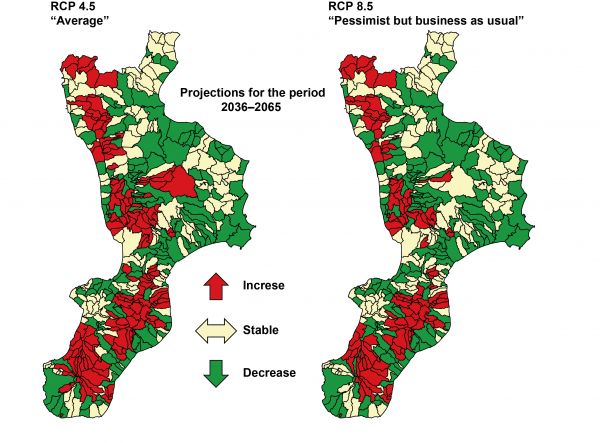 Considering 32 future scenarios of land use/cover changes in Calabria, Italy (afresh made by CMCC), they predict again an increase in landslide occurrences, with diverse spatial distributions. Moreover, they remarked that the observed and expected variations in landslide occurrence and risk are due to changes in natural (landslide triggering and predisposing factors), environmental (land use and land cover) and societal (number and distribution of the exposed elements) components. Obviously, the combined effect of land use/cover change, geo-lithological and rainfall conditions affect landslides. Climatic, environmental, demographic, and economic changes are also strictly correlated, with several feedbacks, to landslide occurrence and variation. Thus, their future aim is to define a model that would comprise all (or at least most of the) cited components, in order to evaluate such complex phenomena as landslides. But this does not mean this is going to happen, as scientific research in Italy is suffering from a generalized lack of research funds and a lack of interest around climate change issues by the politicians.